More people are swapping-out traditional turkey in favor of alternatives such as roast ham or the more exotic (yet also traditional) roast pig's head. What I didn't know was that the dish has a Christmas history going back hundreds of years, particularly in England, where it seems to be enjoying a renaissance of sorts. It turns out that roasted pig's head isn't just an English tradition, but is a worldwide phenomenon. Mexico has it's own roast pig's head tradition, as do the Filipinos, Polynesians, and Scandinavians to mention only a few. It's making its way into high-end restaurants too. 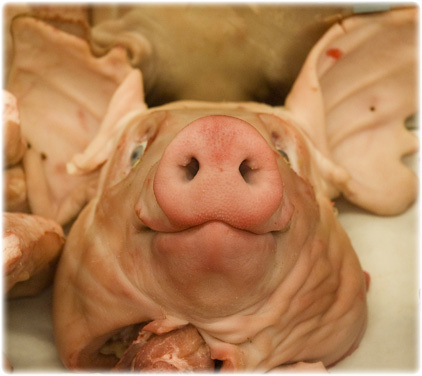 Thinking of roasted pig's head for the Christmas feast? Not too long ago, we were reading an old children's book (Take Joy! by Tasha Tudor) which showed a picture of the traditional Boar's Head Christmas feast, together with an associated carol. 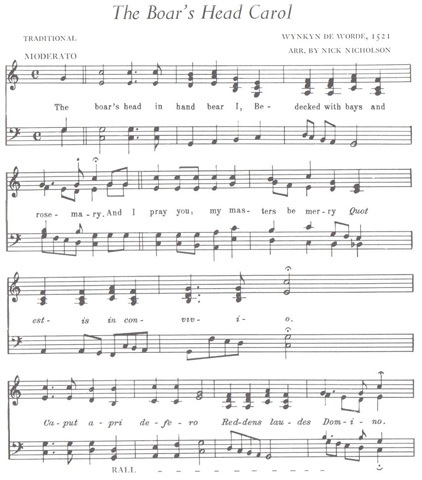 A carol about eating a pig's head? Yes. 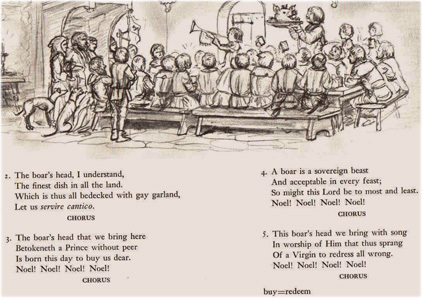 Here is the Boar's Head carol being sung (it's really quite a pretty carol). While it's true that we normally think of roast pig's head as more of a Medieval feast, it seems that this succulent dish is destined to become a modern favorite for those of us who'd like to do something unusually special for family and friends. Part of the allure of the Christmas Pig's Head feast is the stunning presentation --- a whole roasted pig's head on a beautifully garnished platter. To get the right effect, the pig's head needs to be kept whole (not halved). This year I made sure to have our butcher keep a few of the pig's heads whole (we normally halve them) and if you'd like to order one please go ahead and do so (just mention in the "comments" section of the order page that you'd like a whole head) --- it's a wonderful Christmas tradition that fell out of favor in the past century but now seems to be on its way back.